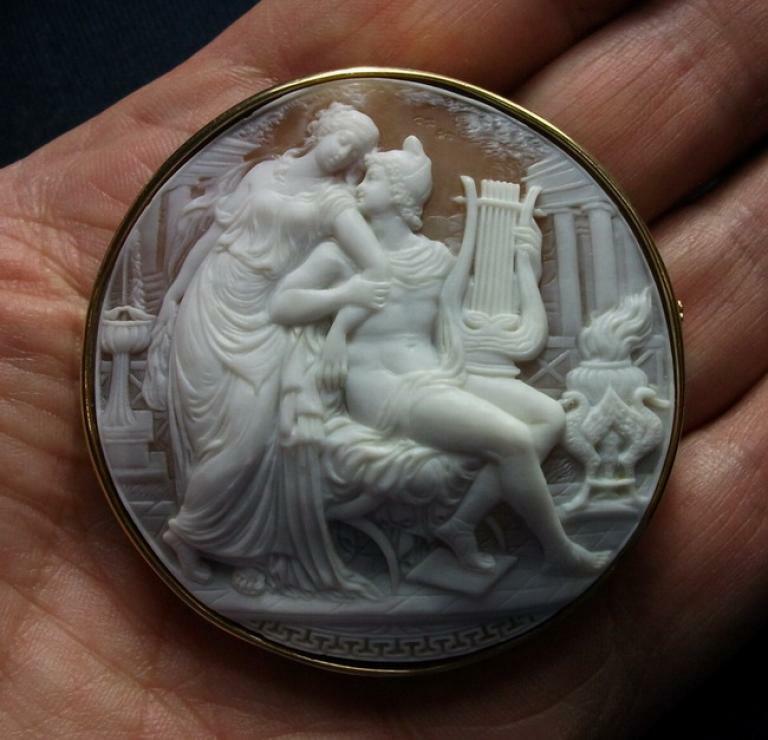 Materials: Sardonyx shell, 18k gold marked. 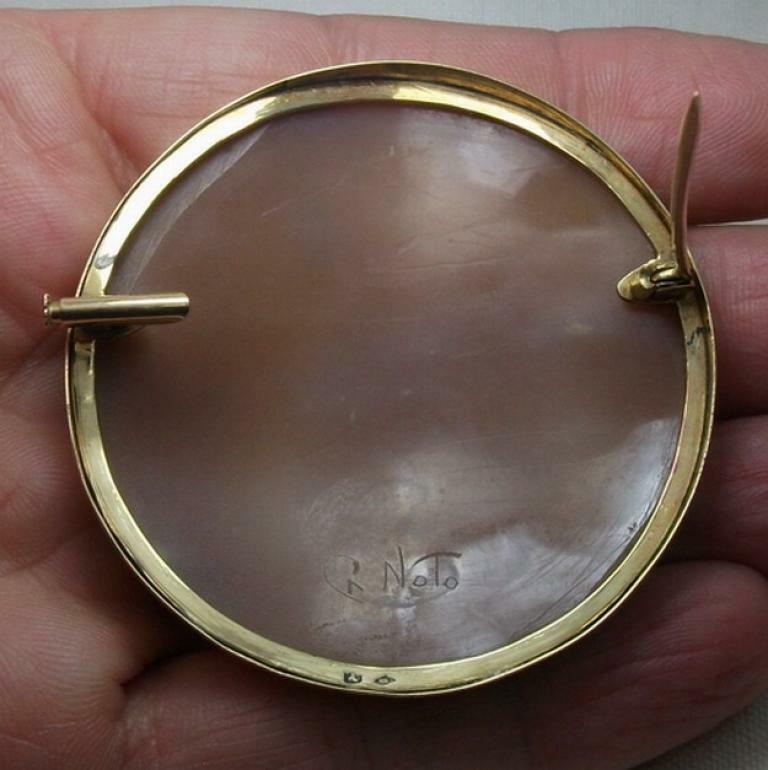 Size: just under 2 1/8" diameter. Date and Origin: circa 1925 Italy, signed by artist Giovanni Noto. Giovanni Noto's students carved cameos and signed them with his name until 1970 circa, many of those cameos were copied by his previously original carved subjects, those cameos are not valuable as the ones carved by him, they can be easily recognised first of all looking at the carving, the ones carved by Giovanni Noto are perfectly carved, the carving is crisp and clean, the style is the same of Victorian era/early 1900, the shells are perfectly cut and the sign on the back is always accompanied by a G before his surname, the bottom edge of the G is elongated and underlines the NOTO surname. The ones carved by his students often are not museum quality ones, looking at the carving you can easily see that often they are excellent or very good quality, their style is more from 1950/1960, this means uplifted noses (like the Barbie one) and less abundance of details, sometime the shells are not perfectly cut and very often the sign on back only reads Noto or the initial letter name has not elongated edge. 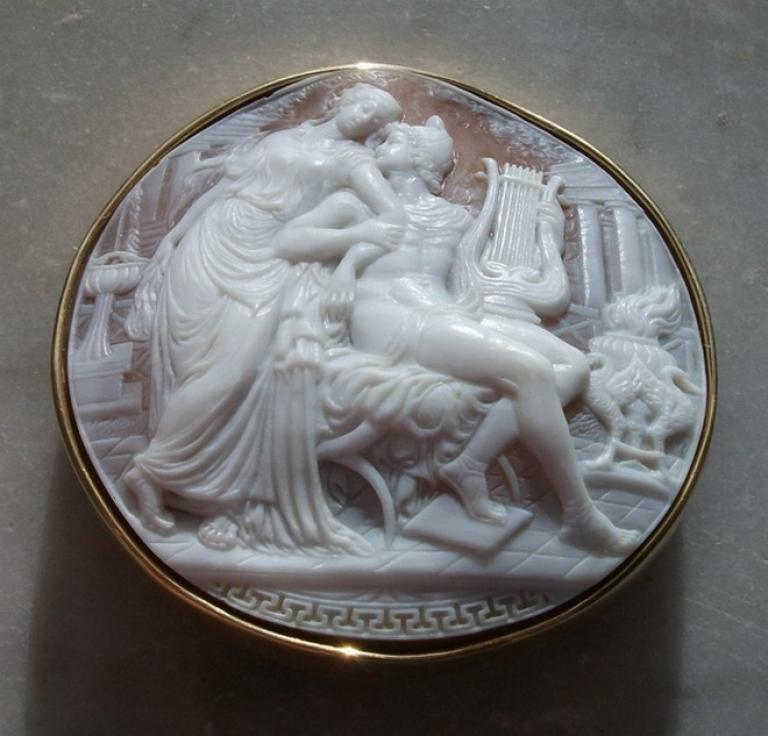 The cameo shown in this page is a real Giovanni Noto one, his own carving. 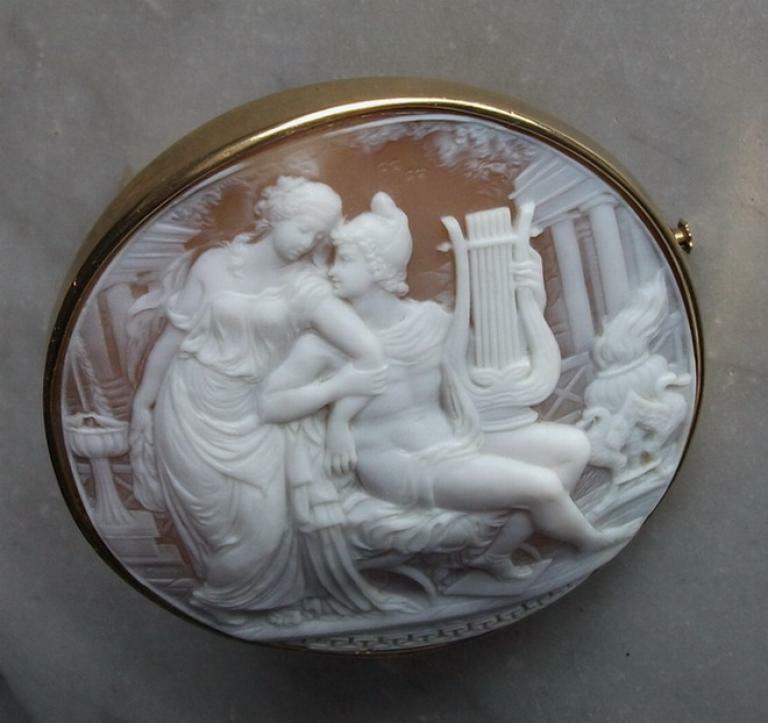 More than museum quality cameo depicting "The love of Helen and Paris" by Jacques Louis David painted in 1788 and now in the Louvre museum in Paris, France. 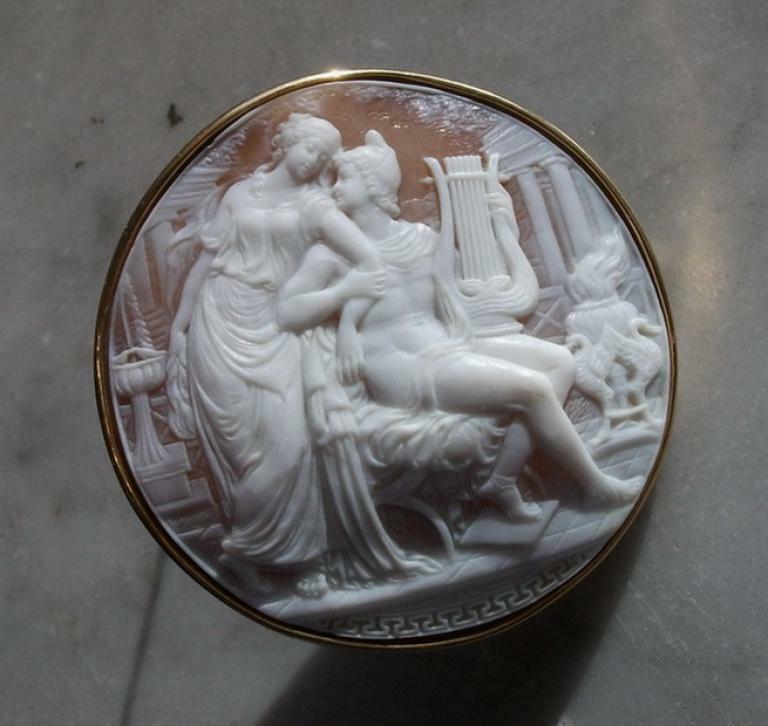 Saying that this is a rare cameo is reductive, this one is more than rare as subject and because it is signed by one of most celebrated cameos carver of the world. This is something that I really could never expect to find. 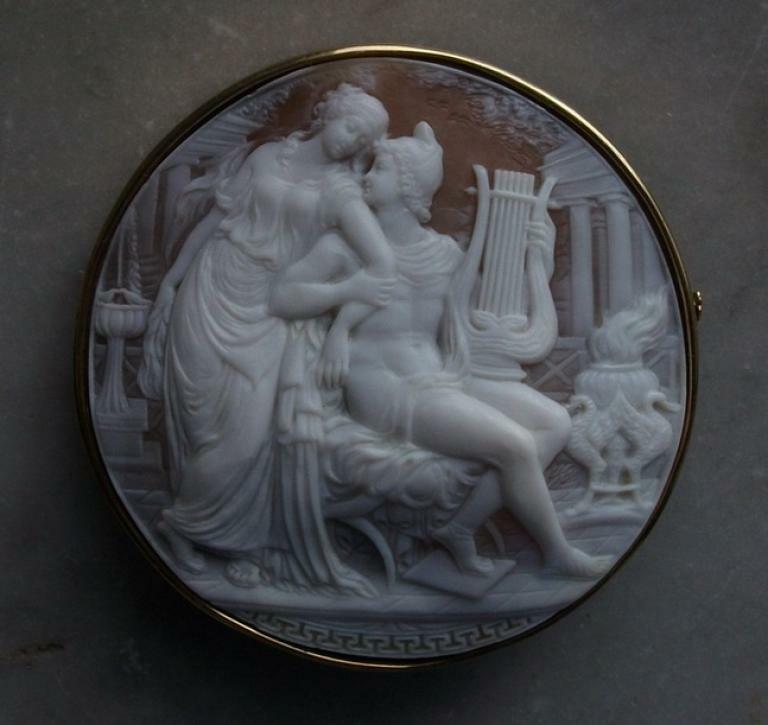 Pictures, even if beautiful, can't catch the total beauty of this cameo that, as always, is much better seen in person. The abundance of details. 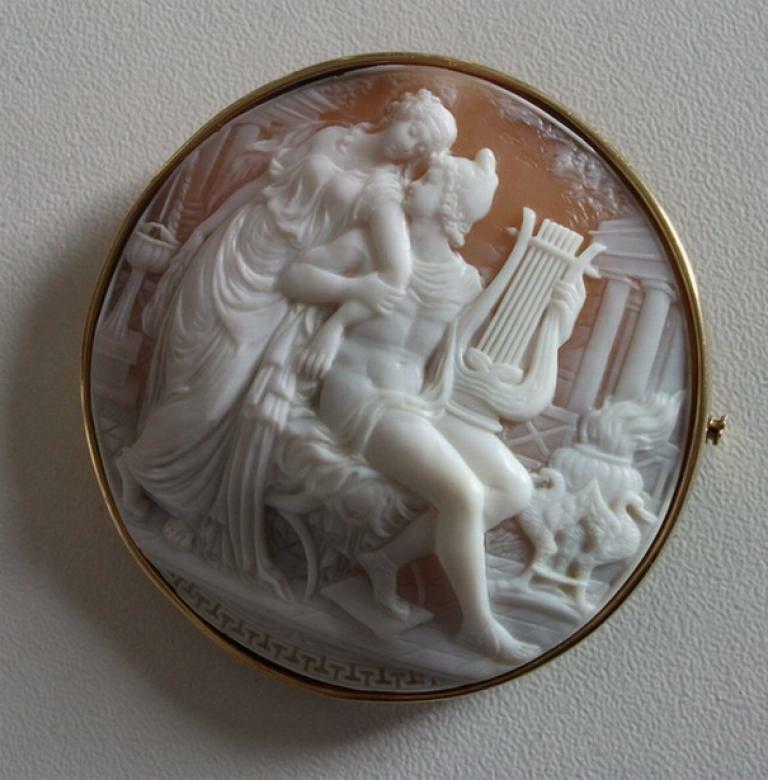 perfectly taken as they are in the painting, their perfect carving, make this cameo more than a work of art. Really there are no words to describe the perfection of this cameo. 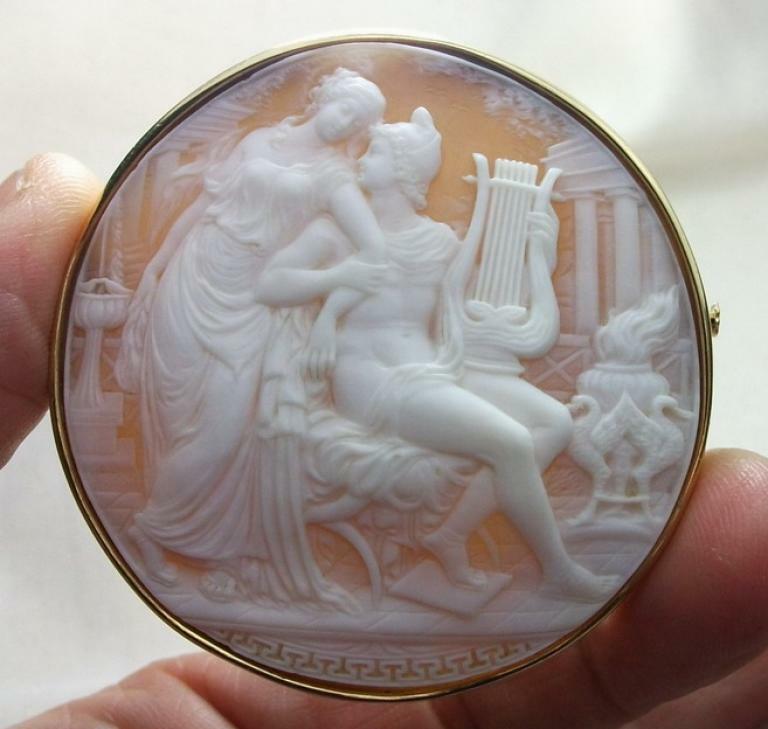 The cameo is round, enough unusual as, you know, the most of cameos are carved on oval shell. 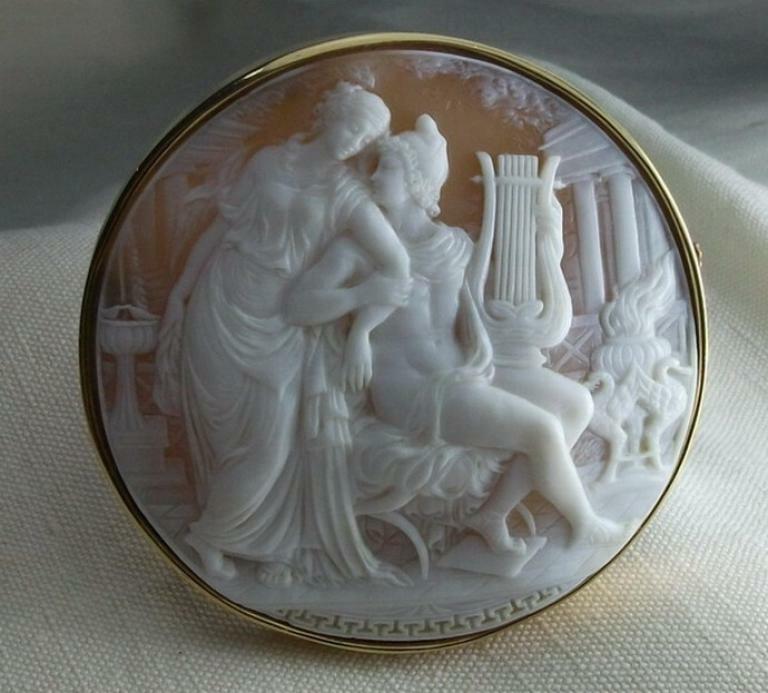 Everything in this cameo is poetry, just like in the painting the carver was able to put in this work love and sensuality and sweetness, look at how Helen is softly leant on Paris shoulder and how he holds her arm strongly, look at her painted hand and then look at the carved one, they are just the same. the artist did not make only a copy from the painting, he created another artwork giving it an its own soul. This is the skill of a great carver. 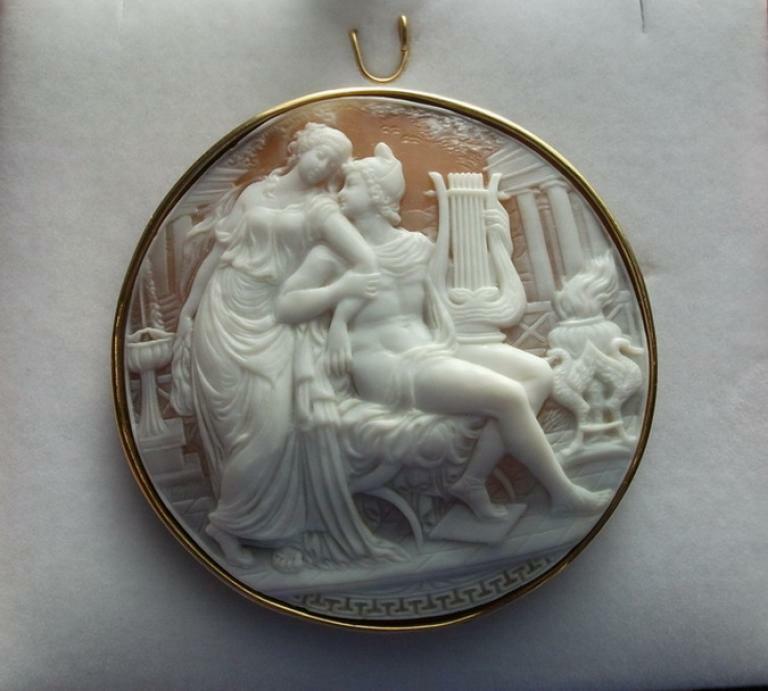 This is another once in a lifetime piece. 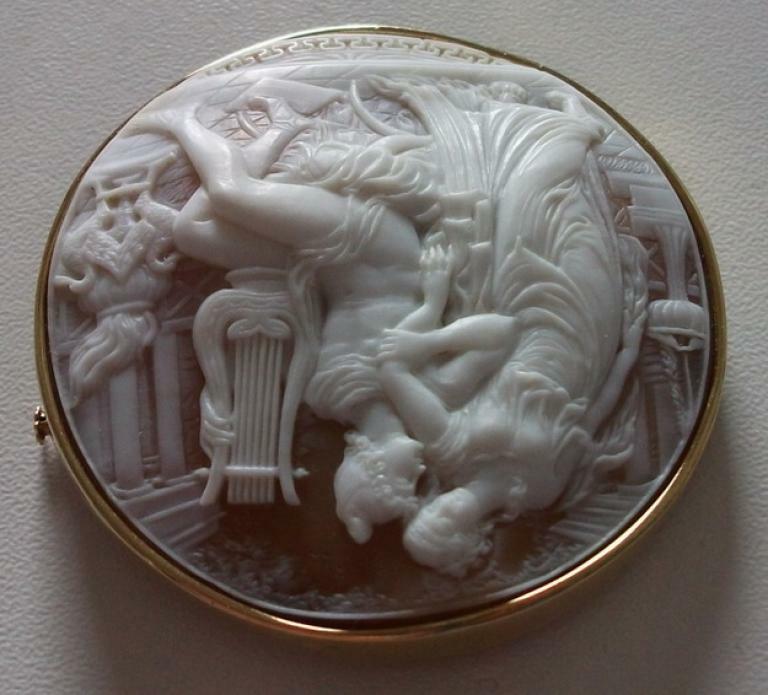 Born in Torre del Greco (the world capital of cameo carving) in 1902 at age 17 he won first prize in the art of engraving, a year after became the official engraver of the Italian Royal House, receiving a monthly salary for the job of 100 Italian Lire. He achieved the title of Master Engraver and was put in charge with many official works, including the one to celebrate the non-stop crossing by plane of the Atlantic Ocean by Charles Lindbergh in 1927, work now preserved and on display in a museum in New York. He also worked for major international jewellers (Cartier, Bulgari). In 1947 he was the artistic director of the firm of Giovanni Apa in Torre del Greco, producing cameos, a position he held until his death in 1985. 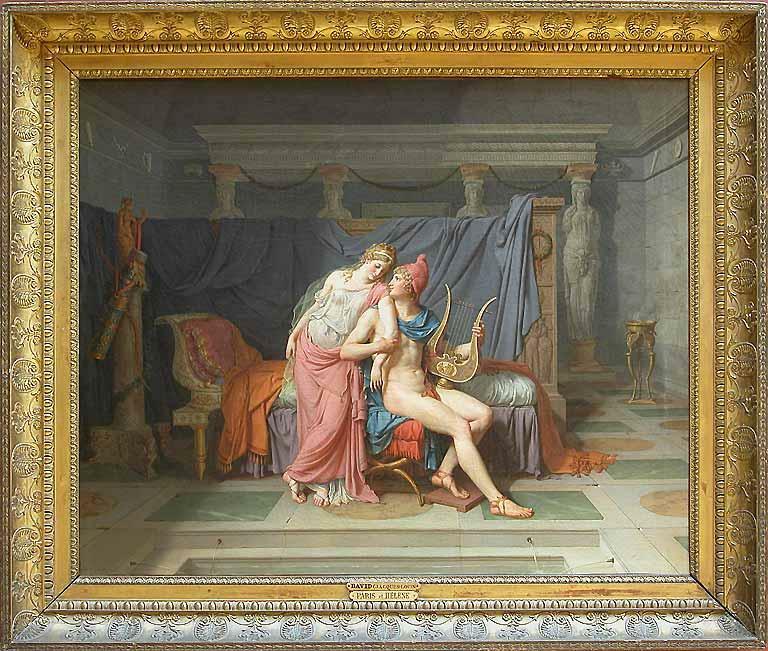 The best of his art is considered the Venus, kept at the Louvre Museum in Paris. 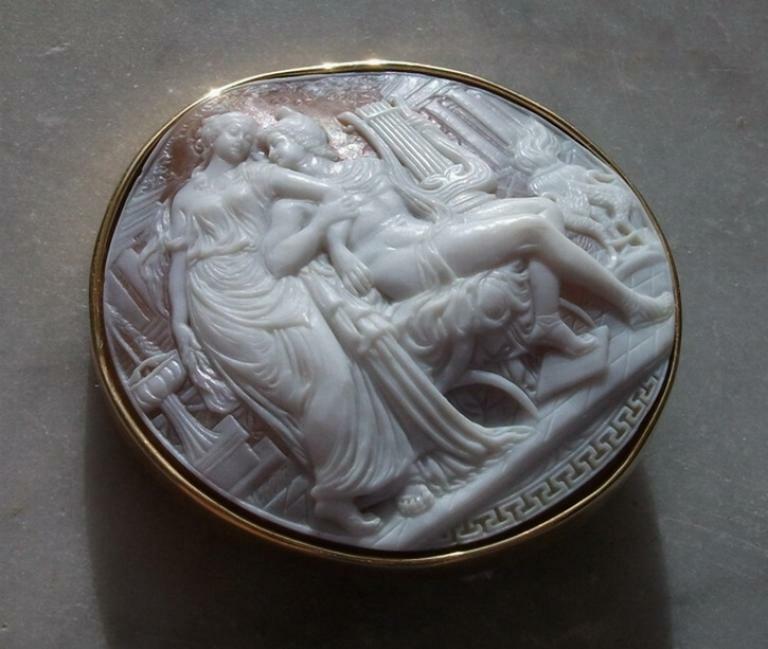 He was appointed Ambassador to the arts from Italy to promote the art of the cameo and of the carving in the world. 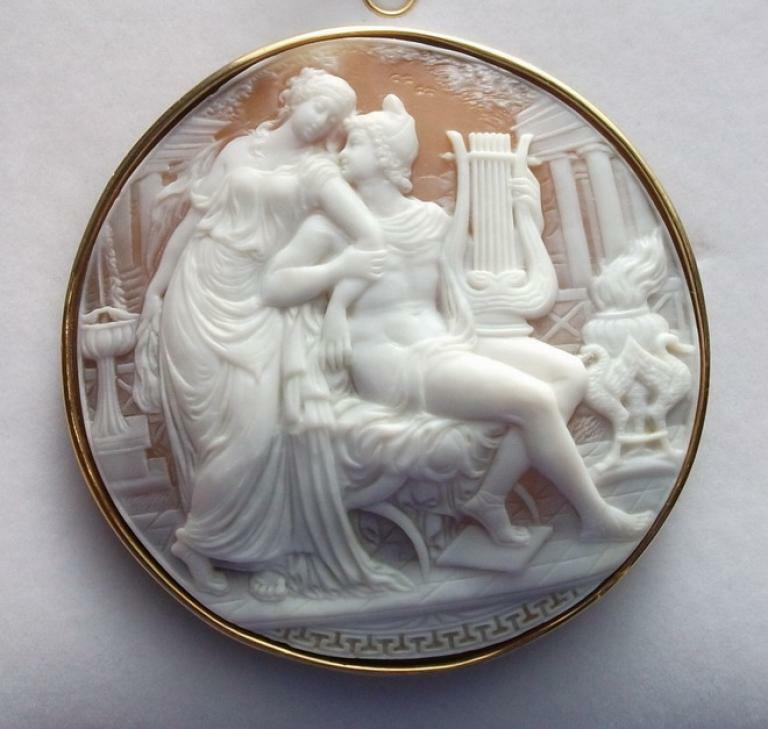 Many works were commissioned by the Italian Republic as official gifts, including a work offered for the wedding of Charles and Diana in England. 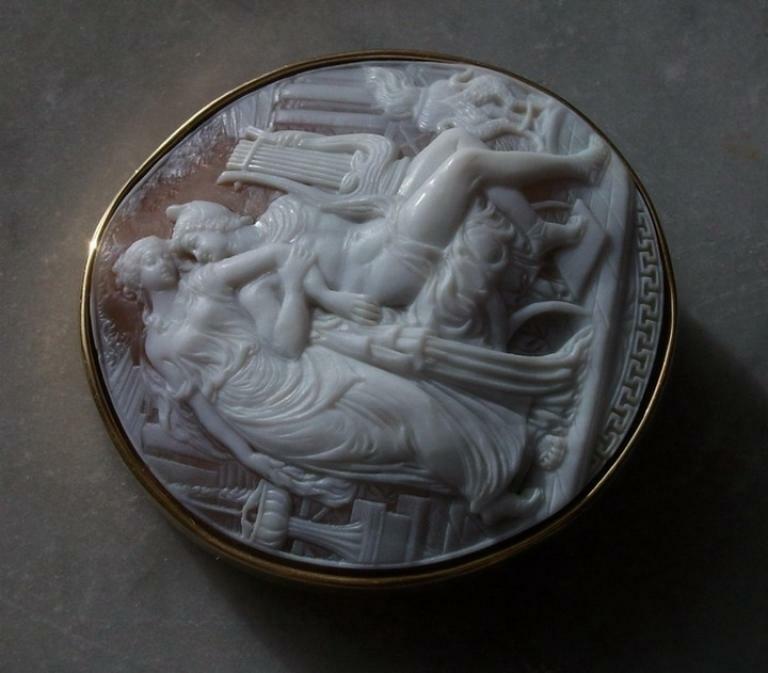 His works are exhibited in the Museum's cameo in Tokyo, the Museum of coral and cameo in Torre del Greco, in the Liverino museum in Torre del Greco, in the Cathedral of Notre Dame in Paris. Japanese television service dedicated to him in the 70s some TV services and an article on his work appeared in the magazine's "18 carat jewelry". He was called the Michelangelo of the burin. For his extraordinary artistic ability has earned an honorary degree. Even today, the School of Noto, which he founded at the goldsmith firm "Roberta" in Torre del Greco, welcomes young students who become skilled carvers. The famous firm Giovanni Apa, still holds some of his great works which are highly priced. 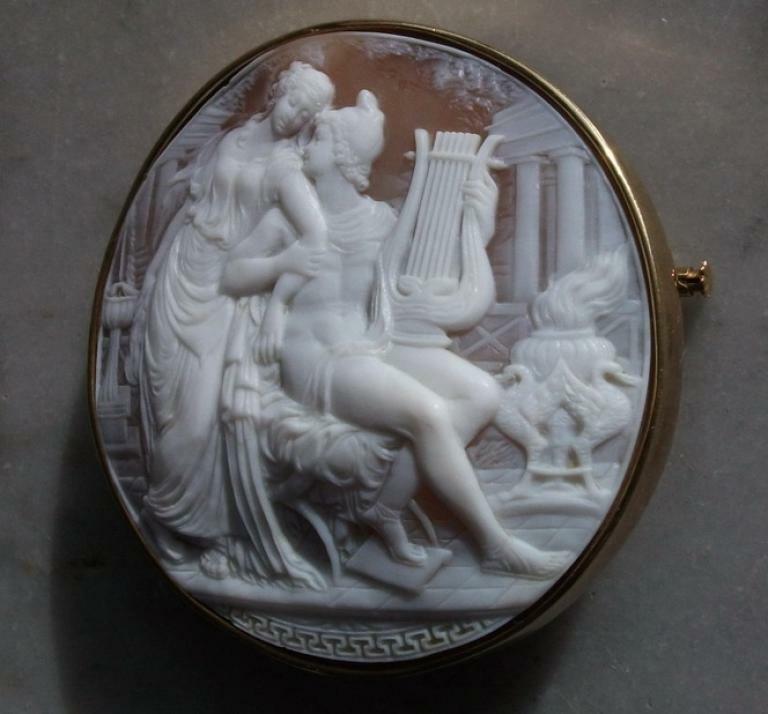 Helen, considered to be the most beautiful woman in the late-bronze-age world, was married to Menelaus, king of Sparta. Her beauty, it is said, was known far and wide. 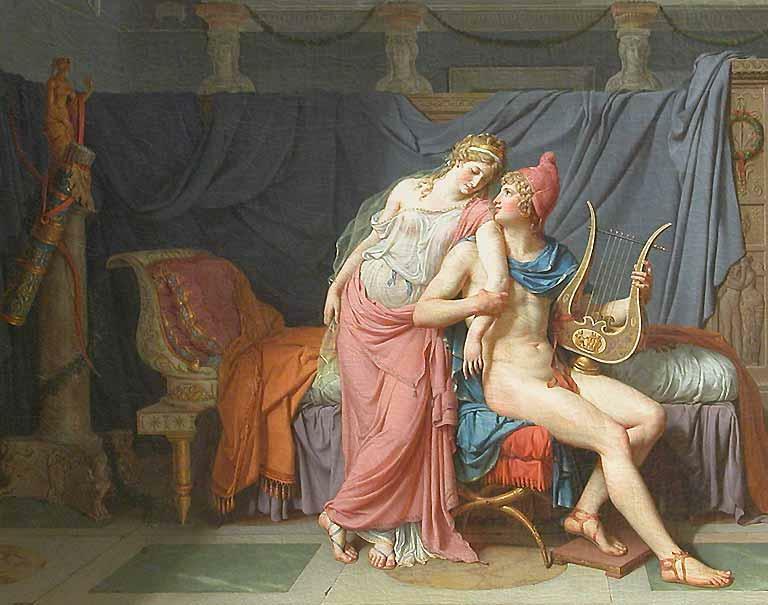 Not bothered by the queen's marital status, Paris (also known as Alexandros, son of Priam, the elderly king of Troy) fell in love with Helen (during a diplomatic mission to Sparta). Wasting little time, Paris abducted her. Menelaus, later in the story, thought he should kill his wife because she had been with a prince of Troy. 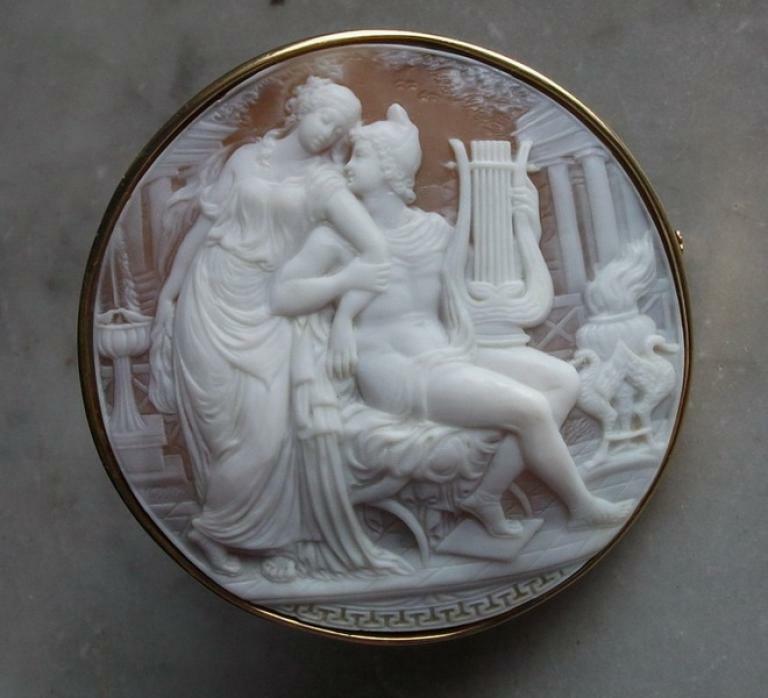 As he raised his sword to kill her, however, Menelaus stopped himself when he saw Helen’s great beauty. The kidnapping of Helen (if that's what it was) was thus successful. As a result, events leading to a war between the Greeks (then called the Achaeans) and the Trojans (the people of Troy) were set in motion.